Like their cousins in the 1800/2200 freestanding series, the 1800 series inserts offer the same tried-and-tested architecture and the same great features, including a magnificent view of the fire through the bay window. Recommended surface 500 to 1,800 sq.ft. Maximum output - EPA test wood 36,300 BTU/h. Maximum output - seasoned cord wood 65,000 BTU/h. 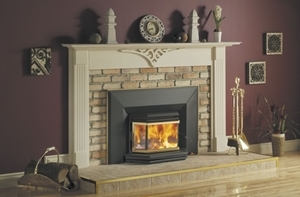 Minimum fireplace opening Width: 25.25"
Door opening dimensions Width: 16.5"